On the Palace on Wheels you’ll enjoy style and exclusivity, previously reserved for the Maharajas, as you journey through Rajasthan. Day 1 Delhi: Board the train at Delhi’s Safdarjung Railway Station and after a brief familiarisation by the Khidmatgars (personal attendants), the week long journey through Rajasthan begins. Day 2 Jaipur: The first stop is Jaipur, capital of Rajasthan and popularly known as the Pink City. The city tour begins at the remarkable five-storied Hawa Mahal (Palace of Winds) which was built to enable royal ladies to look out through delicate screened windows and balconies. Proceed to the Amber Fort where you have the chance to interact with elephants. After lunch visit the City Palace complex, home of the erstwhile royal family, then stop at the Royal Observatory (Jantar Mantar) before returning to the train. Day 3 Sawai Madhopur/Chittorgarh: This morning visit the Ranthambore National Park*, considered to be the country’s best wildlife sanctuary for observing the Bengal tiger and also home to more than 300 species of birds. Return to the train and depart for Chittorgarh, where, on arrival, you have time to explore the grand Chittorgarh Fort, one of the largest in India. Day 4 Udaipur: Morning arrival in enchanting Udaipur which resides beside the blue waters of Lake Pichola. Embark on a city tour before lunch at a local hotel and later visit the City Palace, an architectural marvel which towers over the lake and houses a conglomeration of courtyards, pavilions and hanging gardens. Day 5 Jaisalmer: Arrive this morning in Jaisalmer in the heart of the Thar Desert. Tour the imposing yellow sandstone fort that towers magnificently over the city and after lunch, go for an exciting camel ride on the sand dunes. Day 6 Jodhpur: This morning, the train reaches Jodhpur, the second largest city of Rajasthan, which is ringed by a high stone wall with seven gates and several bastions. Your tour will include a visit to the Mehrangarh Fort within which several grand palaces are housed. After lunch at a royal palace hotel, return to the Palace on Wheels. Day 7 Bharatpur/Agra: Early this morning pay a visit to the world famous bird sanctuary, Keoladeo Ghana National Park, the nesting place of thousands of egrets, Siberian cranes, migratory water fowl and other species. Reboard the train and continue to Agra for the opportunity to tour the incredible Taj Mahal which is sure to be the highlight of any journey in India. You will also visit Agra Fort before returning to the Palace on Wheels for a final evening. Day 8 Delhi: After breakfast, it’s time to bid farewell to your fellow travellers as you disembark at Delhi’s Safdarjung Railway Station. 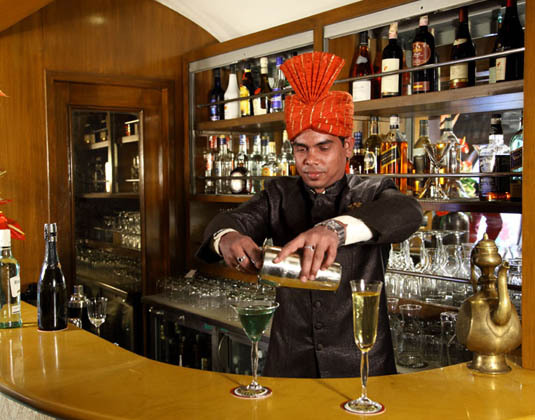 The Palace on Wheels boasts a bar and two wonderful restaurants, The Maharaja and The Maharani, each serving continental, Chinese, Indian and Rajasthani cuisines. Every coach has been aesthetically decorated in royal style with sumptuous upholstery and antique furnishings. Accommodation is in deluxe saloons, with twin beds, and en suite shower. There are two trains in operation. Departures: Most Wednesdays between Sep 18-Apr & Sep-Dec 19. Meals: Full board. Tea/coffee and mineral water also included. Tour price: The price shown is based on the best value travel dates in low season and includes 7 nights accommodation and sightseeing as stated. Note: *Ranthambore National Park is closed during the month of September; instead guests will be taken to Mansigh Sanctuary.